This set of 35 cards is designed to aid children in learning their sounds. 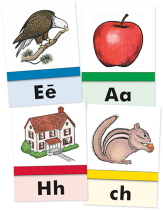 Each card shows a phonetic sound and a picture of an object whose beginning sound corresponds with the phonetic sound. Cards go along with the Learning to Read LightUnits and are essential for the course. Each card measures 4 x 5. On the back of each card is the rhyme learned to connect the sound with the letter.